A strainer is essentially a screen installed to allow water to pass through, but not larger items. The larger items fall to the bottom or are held in a basket for later clean out. Strainers come in several different styles based on the needs. 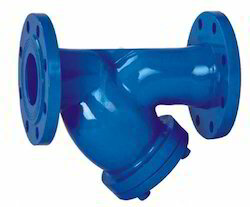 Strainers are used in industrial, municipal, and irrigation applications, and can be designed for very high flow rates. When paired with a controller and flush valve, a strainer can be fully automated. Suspended particles collect on the inside of the screen, and the flush valve opens to expel the buildup. Y strainer medium can apply for water, oil.